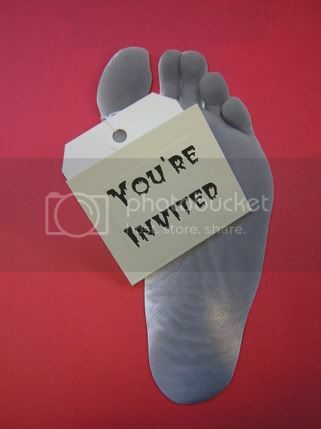 All I did was take a photograph of my dad's foot, print them out, and attach a tag with all the party info on it. I also put "Conway Morgue" as the return address on the envelope. I wish I could have posted this sooner, but it took me a while to put together 30 of them. Those blow my bat invitations out of the water! those are some of the best invitations I've seen!